I had been conveniently pushing any holiday plans since my little one’s birth. Of course holidays are not on your agenda for the first three months after the baby is born, there are tons of other things to deal with !!! Once Mahira turned 7 months we started discussing about holidays,Yup life starts getting back on track once the baby is 6 months old :P.There was no need for a lot of research to choose a holiday destination. 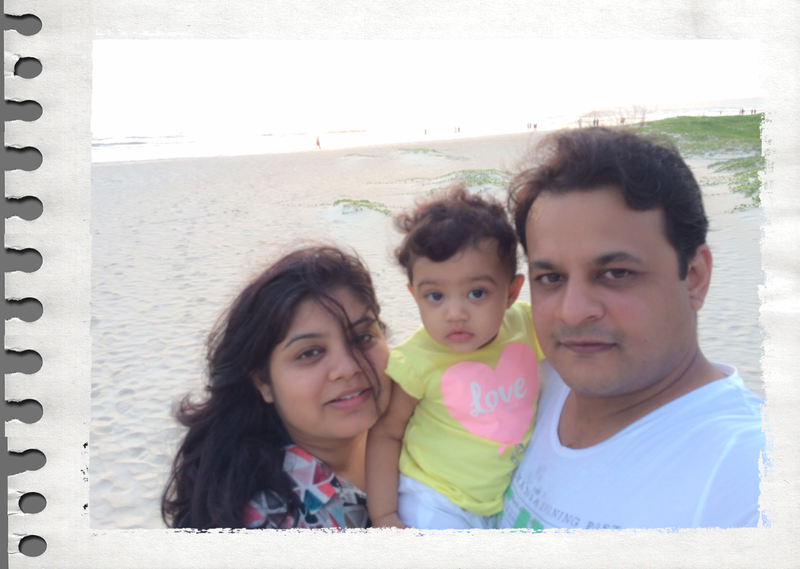 Our first vacation had to be Goa, the place brings so much joy to me and I really wanted to share that with Mahira. Since this was going to be her first flight we were a little anxious (read really anxious!! ), who likes a screaming baby on a flight. We were all geared up and had a lot of props to keep her engaged during the flight like toys, teethers and a number of rhymes on our i pads and phone. Did it work? Sort of but mot much, the idea of sitting in one place for an hour is just not acceptable to her and that’s what made her scream, yes you read it right she did “scream”, but we survived. The next surprise for her was the hotel room for the first half hour she kept staring at all the stuff in the around her. Everything looked different, she was extremely quiet for the rest of the day.We carried a some of her favorite toys, the moment I showed her those she started showing some excitement. Once she familiarized herself to the surroundings the real fun began, she just wouldn’t stay in the room and would want to go out near the sea all the time. She loved the sound of sea and the fresh air around us. She shares the same love for water as her parents :). Goa is going to be our favorite holiday destination i guess and truly truly hope,there’s no bigger joy than sharing your most loved things with the love of your life. Previous Previous post: Arghhh! My baby doesn’t play with toys!! !